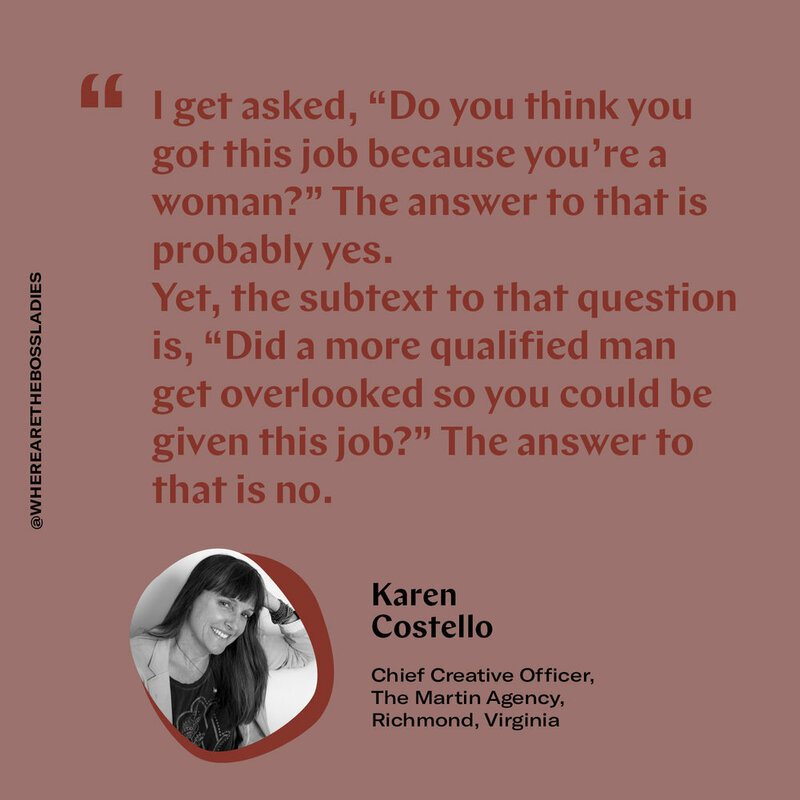 This Boss: Karen Costello, CCO of The Martin Agency — Where Are The Boss Ladies? I met Karen at the TimesUpAd event in New York. She is such a warm, real and awesome lady. She’s the type of boss we want to work for. Tell us about becoming a CCO. Karen Costello: I wasn’t sure I wanted this job. Too far away from making. Too much part of “the establishment.” Too much stress. Too much time away from family. It was terrifying, actually. Couple all that with the circumstance in which the job was offered to me: walk into the burning building that is an agency that just went through a sexual harassment scandal. I wanted to run so fast from that job, and thought more than once of telling my family that we were packing up and moving back to California. But then my 12-year-old daughter gave me a moment of profound clarity, as kids often do. And I realized, this is my opportunity to change the leadership paradigm. I don’t have to work and lead in the way that everyone did who came before me. I could help this broken industry in all the ways I may have felt powerless to do so before. I could create opportunity for those who needed and deserved it. And when I looked at the job like that, I felt there was simply no other decision I could make but yes. How is it like to follow Joe Alexander? Karen Costello: It is a very intense experience to be the person who follows someone let go because of sexual harassment allegations. And when you’re a woman, it’s even more so. The question that is often on people’s minds and is often asked of me is, “Do you think you got this job because you’re a woman?” The answer to that is probably yes. But here’s what is also true: I am incredibly qualified for this job. I could have taken a role like this 10 years ago if I’d chosen to. In fact, I am more qualified for this role than many men who get it. Which got me thinking that often the subtext to that question is, “Did a more qualified man get overlooked so you could be given the job?” The answer to that question is no. So, while I may not have been sure about wanting the role, and quite certain my gender opened the door, I plan to take this opportunity to do whatever I can to create equitable workplaces for everyone and prove that great, award-winning work can be done in a humane environment where personal lives are not sacrificed and all people feel respected. First off, we eliminated the gender pay gap. Incredible. We didn’t know that was even…possible. Karen Costello: This drives me nuts. The media seems obsessed with talking about the downfalls of men, rather than the accomplishments of women. In most articles reporting on my CCO position—which is actually big news in advertising, given that so few women are in that position—90% of the article spoke of the sexual harassment allegation and less than 10% talked about the 25+ years I’ve spent in advertising launching brands, building agencies, winning awards, creating amazing client relationships and fighting for women in leadership. Instead of reporting on the progressive move to put two women at the top of a high-profile agency, the press still wanted to talk about the past. When we eliminated the gender pay gap at our agency—a big deal!—astoundingly, this was still not news. I don’t bring all this up because I have a selfish need to be talked about. Anyone who has worked with me over the years knows this to be true. I bring it up because this kind of one dimensional media coverage just perpetuates the male power structure paradigm. I look forward to a future when the accomplishments of a woman are as newsworthy as the downfall of a man. Does a man have to fail for a woman to succeed? Karen Costello: I don’t believe that we, as an industry, will truly change unless we open our aperture much wider on what we believe makes a great leader. People often promote people to leadership who are like them. And in advertising, that has meant a lot of white men, for starters. But it’s also often been a certain kind of person, most likely someone who has the confidence to speak up loudly and often and who is great at presenting their ideas. But what about quiet strength? People, often women, who might not speak up all the time, and have been used to being interrupted by men all their lives? People for whom empathy is not a sign of weakness, but rather a source of strength? These people may have powerful things to offer in leadership that is overlooked when advertising often rewards the bombastic, overtly opinionated and the outgoing. As a lifelong shy person, I was lucky enough to have a mentor who saw strength in me, beyond being the loudest one in the room. I would advocate for all of us in leadership to look out for the overlooked, champion people who are not like us and pay attention to the quiet ones. I think the industry will be better for it and only then will we truly be nurturing a new generation of leaders. So, where are the boss ladies? Right here. Jan 3, 2019 Happy Newsletter!